MAYBE A MERMAID review with a special guest post from the author, Josephine Cameron. Thank you to the publisher for the free review copy. Who can resist mermaids? From a young age, I’ve always been interested in the fantastical qualities of mermaids. I watched The Little Mermaid over and over and then when I got a little older I watched Splash with Darryl Hannah and Tom Hanks and wondered… could mermaids be real? I wished they were and always tried to spot one when I was on any body of water, especially an ocean. 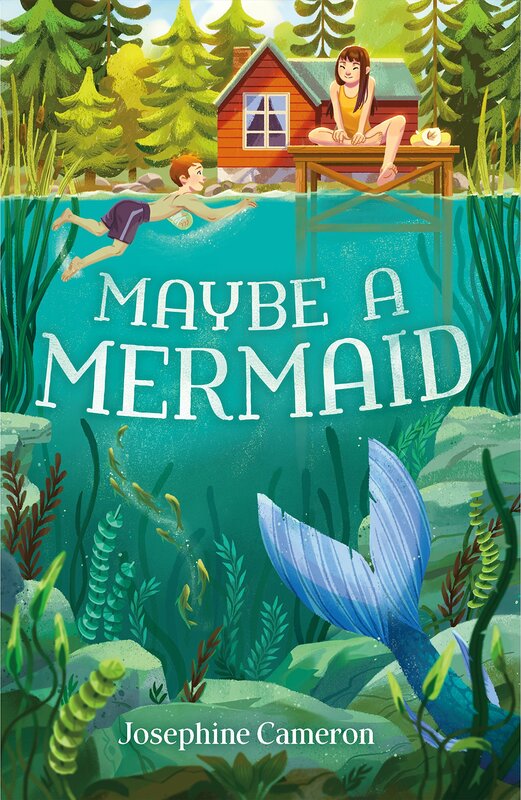 In Maybe a Mermaid by Josephine Cameron, Anthony Gillis and her mom have a special bond being a small family, just the two of them and working together on her mom’s business with Beauty and the Bee cosmetics, a multi-level marketing company. They have just returned to a special lakeside resort where her mom spent summers vacationing. The family is struggling financially but Anthoni doesn’t find out until later just how bad it is. Anthoni’s mom has never kept secrets from her, but suddenly things have taken a turn and Anthoni uncovers secrets that her mom has been keeping from her. This book has so many layers! Friendship and those agonizing pre-teen years, mystery, magical realism ... I loved the mother-daughter dynamics and the mystery surrounding the lake’s rumored mermaid! This will be PERFECT to pick up this summer while you’re lounging on the beach! We have a special guest today I am really excited to introduce to you, Josephine Cameron, who has graciously agreed to write a guest post for us today about her new book! Welcome, Josephine to Teachers Who Read! What is so special about the mother-daughter relationship in the book? In Maybe a Mermaid, Anthoni Gillis and her mom have been a team for as long as Anthoni can remember. For the past five years, the two of them have been bouncing from town to town, selling honey-based beauty products for a multi-level marketing company, Beauty & the Bee. Together, the Gillis Girls are unstoppable. They have a Five-Year Plan with fool-proof Action Steps. They make each other laugh and share a sense of optimism and stick-to-itiveness that they apply to every challenge they encounter. But some challenges are harder to fix than others. When they end up for the summer at the rundown Showboat Resort, Anthoni discovers that her mom hasn’t exactly been upfront about their financial situation, and she starts to see their relationship in a different light. I think most of us reach a point in our lives when we realize that our parents aren’t actually superheroes. They can’t fix everything. And in fact, they’re just regular humans with problems of their own, trying to figure out how to get through the day. It’s a shaky, slightly terrifying realization. But it’s also an opportunity to find resiliency, independence, a sense of self. And in the best-case scenario, like Anthoni’s, it’s a moment when we can look around and find support and hope in True Blue Friends (who sometimes show up where we least expect them). Thank you, Josephine, for stopping by today! I adored Maybe a Mermaid and cannot wait to discuss this one with students and friends! Maybe a Mermaid will be released on Tuesday, March 26th. Don't miss this one!